Storyline: Mama Frances is in the kitchen, preparing vegetables for cooking when ‘Tricia Ann asks her if she can go Someplace Special all by herself. She’s all dressed up in a nice blue dress with a yellow ribbon, a hat, and a hand purse. ‘Tricia Ann is about 12 years old but as her grandmother, Mama Frances, says, “goin’ off alone is a mighty big step”. But the girl knows the way and she convinces her grandmother that she’s ready for it. Waving good bye, she takes off to Someplace Special. Characters: ‘Tricia Ann, Mama Frances, Mrs. Grannell, Jimmy Lee, Mr. John Willis, Blooming Mary, Hickey. 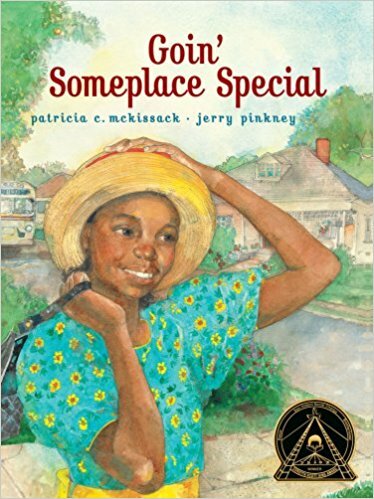 Illustration: Jerry Pinkney is the illustrator of this book. He is a well-known illustrator of over one hundred children books, with five Caldecott Medals, five Coretta Scott King awards and numerous NYT bestsellers hits and awards. His style reflects a certain gentleness, a warm environment by colors and realistic drawings, with soft edges and grace. His scenes enhance the text and bring on subtitle details. Most notable for me were the attitudes of the people portrayed in the pages of the book, their unspoken words, their feelings. The illustration fills the pages with wonderful, earth like colors and animated characters.